Figura 1: The subwoofer active low pass filter board. 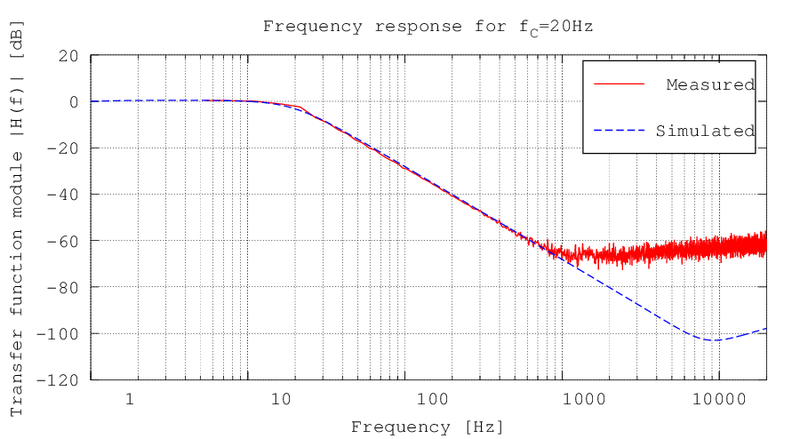 This article presents a simple second order active low pass filter with an adjustable cutoff frequency between 20 Hz and 200 Hz. 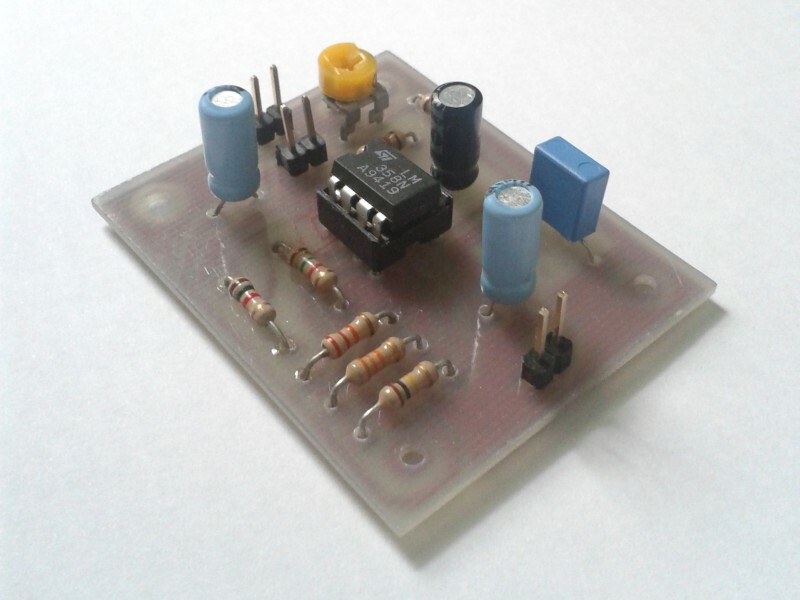 The circuit, which uses a single power supply, works on low power audio signal (that is, line audio levels) and is intended as a filtering element before a power audio amplifier driving a subwoofer loudspeaker. The design is based on the traditional Sallen-Key topology, which offers simple calculations and realization, though the quality factor isn't high. 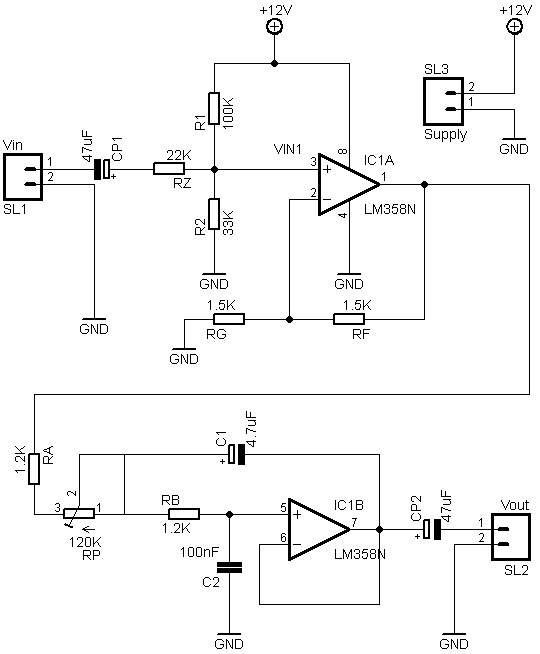 A simpler alternative to this circuit is the Subwoofer passive low pass filter. The filter behaviour was verified both through a LTSpice simulation and through a raw measurement with a PC soundcard and the Visual Analyser software. In the following images the modules of the transfer functions are represented in case of the potentiometer set on the lowest cutoff frequency (Figura 3), and maximum cutoff frequency (Figura 4). It can be notes that the two curves are basically equal, except at high frequencies, where the sound card low sensibility and noise don't allow for a precise measurement. The slope is always -40db per decade, due to the second order filter. Figura 3: Circuit transfer function module in dB in case of a 20 Hz cutoff frequency, obtained through a measurement on the real circuit with a PC soundcard and the Visual Analyser software. The difference between the two curves at high frequencies is due to the low sensibility and noise of the computer sound card. On the abscissa a logarithmic scale was used. In case the cutoff frequency is 20 Hz the resonance peak is not present; on the contrary, this peak appears when fc = 200 Hz. This is coherent with the design process explained in section 2, since the inequation which granted the absence of the peak was evaluated for RP = Rtot, that is for fc = 20 Hz. The resonance peak is anyway acceptable. Figura 4: Circuit transfer function module in dB in case of a 200 Hz cutoff frequency, obtained through a measurement on the real circuit with a PC soundcard and the Visual Analyser software. The difference between the two curves at high frequencies is due to the low sensibility and noise of the computer sound card. On the abscissa a logarithmic scale was used. A negative side of the filter is the badly balanced potentiometer: a linear variation of its resistance doesn't correspond to a linear variation of the cutoff frequency. Below the cutoff frequency as a function of the potentiometer resistance is plotted. 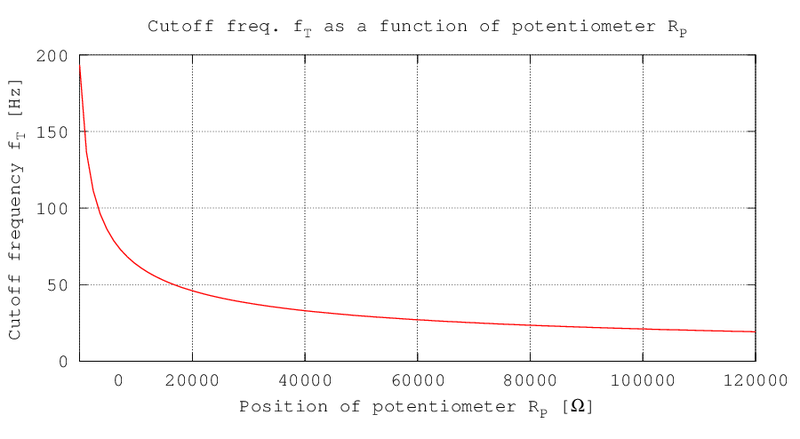 Figura 5: Frequency variation as a function of the potentiometer. The circuit realization is not difficult, since very common components were used, its size is small and its complexity is low. The board shown in figure 1 has a 4cm x 5cm sizes, and therefore it is a submultiple of the Eurocard european standard, which has a size of 160mm x 100mm. The connectors are three: one for the audio input, one for the audio output and one for the power supply. 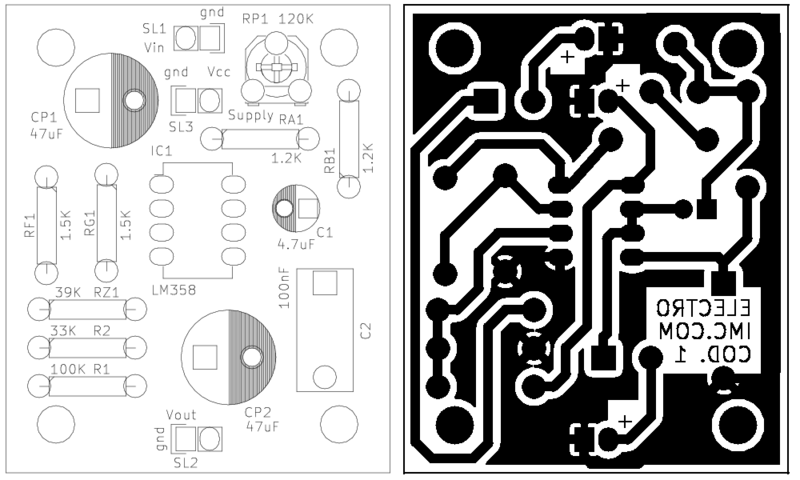 Download the schematic, the printed circuit board, the Gerber files and the pdf for this proyect. Figura 6: Silkscreen and printed circuit board for the filter. For the circuit modification, the input resistance Rz and capacitor CP1 should not be soldered, and instead of them two resistors with the double of the value should be put, together with their decoupling capacitors. Figura 7: The modification for the filter input to obtain a stereo input. Rz and CP1 must be substituted with two resistors in parallel with the double of the value, together with their decoupling capacitors. To find the components values, we can make some brief considerations: we decide that the VIN voltage is reported, unchanged, at the output; in order to polarize correctly the signal we must sum half of the power supply voltage to VIN; finally, we chose α=2, since this allows us to use RF = RG. Now we can write an equations system based on the VIN e Valim gains: And, by solving it, we obtain; To complete the information about the system we can compute the input impedance of the whole circuit: Choosing R2 = 33 KΩ and keeping in mind the E12 series approximation, we obtain good values: R1 = 100 KΩ, Rz = 22 KΩ, Rin = 63 KΩ. The CP1 capacitor blocks the polarization current of the circuit, so that it doesn't flow into the device connected to the input. Said in other terms, it is a high pass filter with the following cutoff frequency: We impose that the cutoff frequency of this filter is much lower than the circuit minimum working frequency, for instance 1Hz. Since Rin = 66 KΩ, we obtain C = 2.5 uF. The 47 uF capacitor is therefore more than adequate the decoupling. 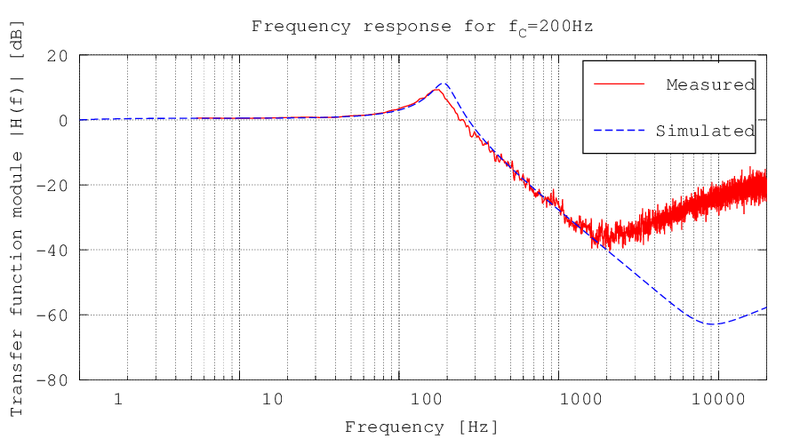 Similar considerations can be done for CP2, substituting to Rin the load resistance; this resistance will be quite high, since it's the amplifier input. The following stage is the real filter. Many proofs exist on the web for calculating its transfer function, among which the Wikipedia one: Sallen-Key topology. Here it is: where RP is the value assumed by the P1 potentiometer. Analyzing this polynomial it's possible to extract some mathematical expressions useful during the design process. 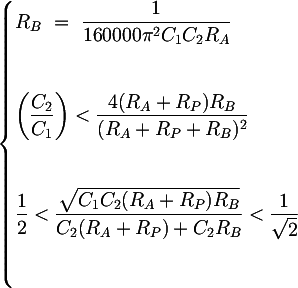 Let's resume the useful equations written until now: In order, they are the equation obtained from the minumum and maximum cutoff frequency, the condition about the discriminant for having complex conjugate poles and the condition about the quality factor for avoiding resonance peaks. Figura 8: Graph used during the design phase to choose the filter components. By setting the parametric values for C1 and C2 the graph can be plotted. 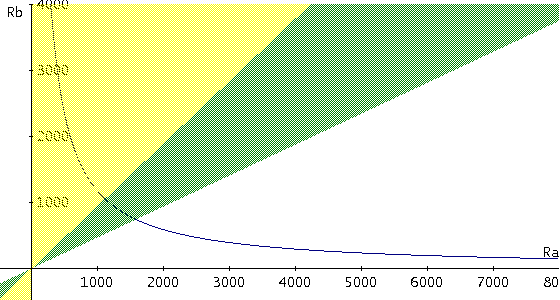 RA and RB values can be chosen in the green area, that is the zone where both inequations are true. 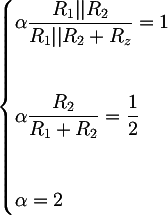 The values are for example RA = 1.2 KΩ, RB = 1.2KΩ, Rtot = 120 KΩ.